전라남도 승주군에 있는 선암사삼층석탑(보물 제395호)을 해체 수리할 때 발견된 유물 3점이다. 동탑 1층의 하부에서 사리 구멍이 발견된 것은 유례가 없는 일이다. 사리 구멍에서 나온 유물은 사리 장엄구로 청자 항아리, 백자 항아리가 각각 1점씩 있었으며, 사리 장치는 백자 항아리에서 나왔다. 이 백자 항아리 안에 비단으로 싼 금동 사리탑이 있고, 사리탑 안에 회백색 타원형의 사리 1개가 있는데, 사리는 팔각 원통 모양의 수정 그릇 안에 있다. 청자삼이소호는 높이 6.5㎝, 아가리 지름 4.1㎝, 밑지름 5.6㎝, 뚜껑 아가리 지름 6.4㎝, 뚜껑 높이 1.5㎝의 크기이다. 뚜껑의 윗면 중앙에 작은 돌대와 같은 꼭지가 있다. 항아리는 어깨가 벌어져 있고 몸체는 풍만하다. 어깨에는 한 줄의 음각선이 둘러져 있으며, 세곳에 각이 지고 구멍이 뚫린 꼭지가 나있다. 유색은 어두운 녹청색으로 미세한 빙렬이 전면에 나 있다. 유개호는 총 높이 12㎝, 아가리 지름 9.6㎝, 밑지름 7.2㎝, 뚜껑 높이 2.6㎝의 크기이다. 아가리 부분이 넓으며 어깨부터 벌어져서 몸체가 풍만하며, 뚜껑은 조그만 접시 모양으로 중앙에 꼭지가 있다. 유색은 백토로 분장되어 있는 표면에, 담청을 머금은 백색유가 두텁게 입혀져서 불투명하다. 16세기 전반에 제작된 것으로 추정된다. 금동사리탑은 높이 6.2㎝, 폭 1.9㎝의 크기이다. 사리가 모셔진 팔각 원통 모양의 이 사리탑은 백자 항아리 안에서 발견되었다. 3겹의 꽃잎이 위로 벌어진 연좌 위에 탑의 몸체와 지붕돌을 갖추었다. 사리탑은 14세기경에 만들어진 것으로 추정된다. 고려 말의 사리장치 연구는 물론 당시의 금속공예 연구에도 중요한 자료가 된다. These three relics were discovered when the East and West Three-story Stone Pagodas of Seonamsa Temple, Suncheon (Treasure No. 395) were being dismantled and repaired. The fact that a sarira hole was found in the lower part of a stone pagoda was unprecedented. The relics from the sarira hole include a celadon jar and a white porcelain jar, with the sarira casket found inside the latter. Inside the white porcelain jar was a gilt-bronze miniature pagoda wrapped in silk cloth. One piece of round-shaped, gray white sarira was kept in a crystal bowl in the shape of an octagonal cylinder inside the pagoda. The celadon jar has height of 6.5 cm, mouth diameter of 4.1 cm, base diameter of 5.6 cm, lid diameter of 6.4 cm, and lid height of 1.5 cm. At the center of the upper side of the lid is a small protrusion. The jar has a wide shoulder and a plump body, with a line engraved around the shoulder. An angled protrusion with a hole is located in three different places on the shoulder. The glaze coating has dark verdigris color, and there are minute cracks on the surface. 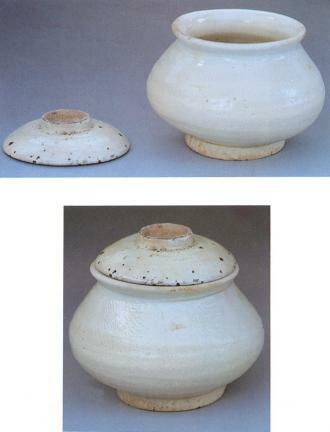 The white porcelain jar has height of 12 cm, mouth diameter of 9.6 cm, base diameter of 7.2 cm, and lid height of 2.6 cm. It has a wide mouth and a plump body that expands from the shoulder. The lid is made in the shape of a small plate, with a protrusion at the center. 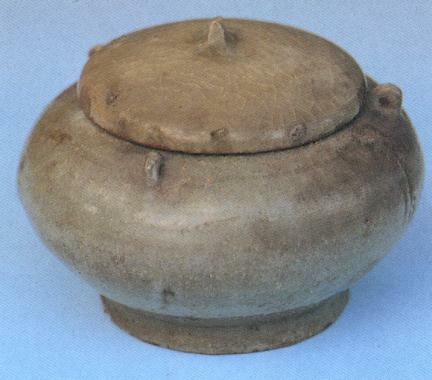 The surface of the jar is made of white clay and coated with a thick layer of opaque milky-white glaze. It seems to have been produced during the first half of the 16th century. 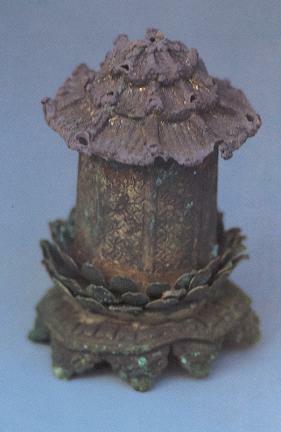 The gilt-bronze miniature pagoda measures 6.2 cm high and 1.9 cm wide. The sarira was kept in this octagonal-shaped pagoda, which was found inside the white porcelain jar. The body of the pagoda is placed on the pedestal in the shape of three-layer lotus leaves, and a roof is placed on top of the body. This miniature pagoda is presumed to have been made around the 14th century. These relics provide valuable information on the reliquaries as well as the metalwork made in the late Goryeo Period.